Pursuant to the remarkable admission of Ken Goldstein’s secret identity and the subsequent discovery of photographic evidence concerning Mr. Goldstein’s apparent agelessness, we here at mike.whybark.com moved with the lightning reflexes of the distributed, all-digital startup and despatched crack teams of research associates to photo libraries the world over in hopes of finding further traces of Mr. Goldstein’s Zelig-like footprints throughout history. This week’s entry in our growing log of KG imagery places the cagey (“Cagey” – get it?) 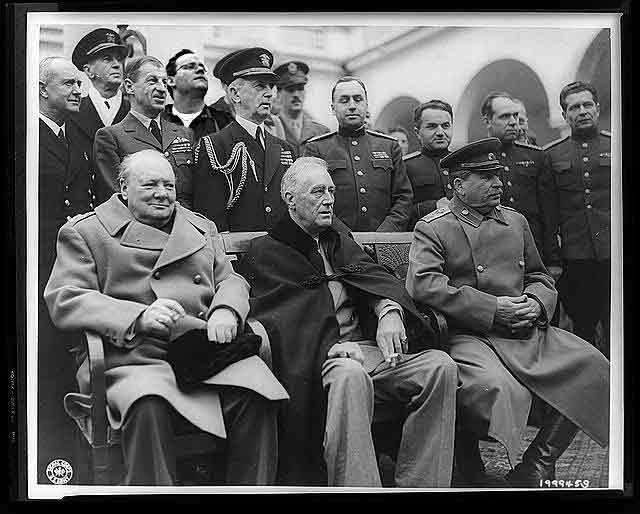 freelance technical writer and sponsor of Girls are Pretty in the crowd of advisors behind the big three at the historic Yalta Conference. There was no associated textual information concerning the boyish six-footer, who retains his youthful exuberance and occasional fits of needy, insecure demonstrativeness in addition to his ageless appearance. Previous Article Oh you cats!